$350.00 In stock - low quantity. Order in the next 17 hours, 49 minutes and it will go out today! In stock - low quantity. Order in the next 17 hours, 49 minutes and it will go out today! Are you looking for funny? Really funny? Many professional magicians consider Dunn's Drink Trick to be one of the funniest bits of business in magic. Ricki Dunn, known as America's Funniest Pickpocket in the 1970s, closed his show with this routine for over twenty years because the visual ridiculousness guaranteed side-splitting laughter. Here's the routine: You pour a glass of cola (milk, or any easy-to-see liquid) and serve it to your seated volunteer. After they drink it you wipe out the glass with the cloth and hand him back the glass which he holds up to his mouth or nose. You gently squeeze his nose (or rub his head, or whatever magical gesture you wish) and suddenly, the audience sees the liquid apparently drain out of his mouth and fill up the glass! Click on the video at the top of the page. This is a hilarious sight gag! Prior to his passing, Ricki bequeathed the trick to Paul Romhany who, over the past few years, re-worked the handling of Ricki's original Dunn's Drink Trick, re-designing the special gimmicked glass to make it more durable and easier to perform. Best of all, the spectator can hold the glass! In memory of Ricki Dunn, Paul Romhany is releasing to the magic community a small number of custom made glasses so you too can perform this outrageously funny and highly visual effect. 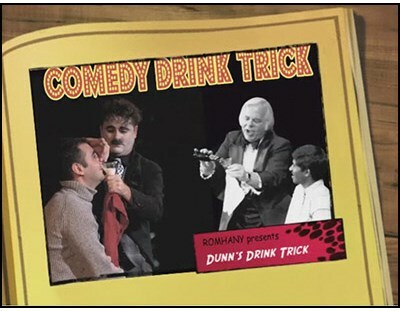 If you are a comedy magician who works for family audience... if you have strong audience management skills... if you are looking for a powerful comic moment of visual magic that catches the audience so off-guard, that they burst into laughter at the sheer absurdity of what they are witnessing, order Paul Romhany's Comedy Drink Trick and get your funny going.